A lot of local businesses are thanking Veterans for their service by giving them free stuff on Veterans Day. Feeling stressed? Massage Envy Spa is holding its annual "Massages for the Military" event, providing free 1-hour massages for more than 2,000 pre-registered military personnel, veterans and their spouses. Jeanette's Bridal is thanking the nation's heroes by giving away free wedding gowns to military brides at its salon in Manassas. The event is held in partnership with Brides Across America. Veterans and active duty military members can choose from a free signature Thank You Meal menu at Applebees on Veterans Day. If you're interested in getting a free meal, you must present a valid ID or be in uniform. Bob Evans is offering free all–you-can-eat hotcakes to veterans and active military personnel. All you need to do is show a valid military ID. Any veteran needing a haircut can head over to Great Clips for a free haircut, and you don't need an appointment. If you don't have the time Monday, you can pick up a rain check. Stop by any Boston Market on Veterans Day and you will get a free whole chicken with the purchase of a family meal when you show a military ID. 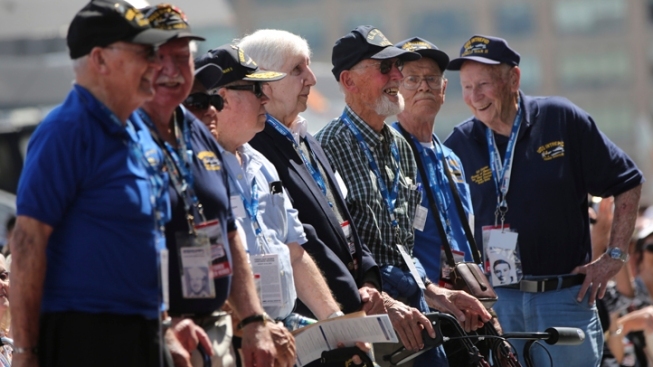 Veterans will have access to over 100 National Parks that require entrance fees for free. Bed Bath and Beyond is giving veterans 20 percent off their entire purchase from Nov. 9-11. The discount is valid for active duty, DoD, reserves, guard, retirees, veterans, and military spouses. Home Depot is offers a 10 percent discount to veterans year-round. Lowe's is also offering a 10 percent discount on Veterans Day. The offer is available in-stores only. Walgreens is offering veterans and active duty military personnel a 15 percent discount on eligible store items and 20 percent off Walgreens, Nice! And W brand products on Veterans Day. Vets who stop by Ikea Monday can get a free entrée, which includes a sandwich, hot dish or entrée salad. Feel free to stop if you see the hot light on. Krispy Kreme is handing out a free doughnut and coffee to veterans and active duty military personnel. Proof of military service is required. You can also wear your uniform as proof. To honor those who've worked to protect our country, Tryst is offering a 20 percent discount to veterans and active duty members of the military. You must present your military ID to your server. Craving Italian? All veterans and military active duty will receive a free meal from a special menu at Olive Garden on Veterans Day. During the entire month of November, current military service members and their families get 10% off their bill. Starbucks is offering a tall brewed coffee to veterans, active duty military and their spouses get a free tall at participating U.S. company-owned stores. Militarybenefits.info has listed even more discounts and sales for vets and their families, ranging from free Brazilian steakhouse dinners to oil changes. They've even posted a meal guide of deals for not only veterans, but also active duty and retired military. Many offers require a valid military ID or proof of military service.